Discover the country and a career! Whether you’re ready to jump in, or you’ve hesitated in the past about becoming a travel nurse, ADEX will help you explore a career with great possibilities. Here you can try nursing in a wide variety of locations and clinical settings. Plus, we have options for short- and long-term contracts all around the country. Our compensation and benefits stand out among our competitors. We also offer unmatched support for travel and relocation. 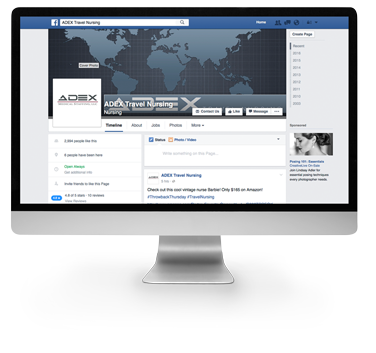 With our years of experience, ADEX is here to help your career grow with our career coaching. We work to build a long-lasting, fruitful relationship with all of our healthcare professionals. The Northern Inyo Healthcare District is fulfilling more staffing needs with traveling nurses! Travelers fill necessary positions. Their presence allows them to maintain continuously all the services they offer and for a preservation of jobs. OB especially has a long history of using these people. Search for jobs in California. When on a travel assignment, it can be tough to feel at home in your new space. A new work environment, new hospital, new coworkers, new neighbors, new climate -- it can be a sensory and mental overload. Read more. I love working with ADEX because my recruiter has made me feel like family. She has been absolutely amazing! I enjoy being able to talk with her and share my experiences and things that I have accomplished. Whether you like sun and ocean, quiet mountain retreats, the hustle and bustle of city life, or all three, ADEX has travel positions that are right for you. Let your career double as a means to explore the country!